The leading sustainable agriculture company could face several short and long-term obstacles that cause its stock to fall. While Monsanto Company (NYSE:MON) is often the source of debate and controversy, there's no disputing the tremendous growth the company has delivered to shareholders in the last decade. Investors may still be optimistic about the company's future with share prices approaching levels last witnessed before the Great Recession. Growth initiatives are in place, share buybacks are being accelerated, and new products are launching every year. What's not to like? Well, as every Foolish investor knows, stocks can go up or down for various reasons. Let's take a look at three reasons Monsanto Company's stock could fall in the next several months or years. On the same day the failed $40 billion merger with rival Syngenta was announced, Monsanto Company management pivoted by announcing a $4.5 billion debt issuance. What would be the main use of the money, you ask? While some of the net proceeds would fund general corporate needs, the bulk of the funds would be thrown at a $6 billion accelerated share repurchase program. The accelerated initiative is actually part of a larger $10 billion share repurchase program that will take place over a two year period. Plenty of companies have been taking advantage of low borrowing costs to fund share repurchases with debt, but "everyone else is doing it" is rarely a good excuse. Despite more than doubling the long-term debt on its balance sheet, Monsanto Company can comfortably swallow more debt (it's targeting a net debt to EBITDA ratio of 1.5 for its 2015 fiscal year). However, using debt in this way creates a false sense of health for individual companies and the broader stock market. Let's view an example from Monsanto Company's third quarter in 2014 compared to the same period last year. In the quarterly comparison, net income actually decreased 5.7%, but EPS only decreased 3.5% thanks to roughly 10 million fewer shares. Now consider that the share repurchase program will gobble up over 51 million outstanding shares in the next six to 12 months and 86 million outstanding shares total in the next two years. In other words, assuming Monsanto Company registers flat growth on the bottom line in 3Q 2015, EPS will still "grow" by at least 11%. While that may appear as a great reason for Monsanto Company stock to rise, it's unsustainable in the long term. Larger consequences could arrive from dozens of the largest companies artificially boosting their EPS with the same practice, especially considering the S&P 500 has a CAPE of 26.3 -- higher than all but three periods in history. Farmers across the United States are gearing up for record harvests of corn and soybeans this fall. The U.S. Department of Agriculture expects over 14 billion bushels of corn and 3.82 billion bushels of soybeans to be grown and plucked from soils when all is said and done. Yields of 167.4 bushels per acre and 45.4 bushels per acre, respectively, will also be records. That would appear to be great news for a seed and trait specialist such as Monsanto Company, but those lofty expectations have come with mixed results. In the third quarter compared to the same period last year, Monsanto Company witnessed a $256 million, or 16%, decrease in corn seed and trait sales that offset a $158 million, or 24%, increase in soybean seed and trait sales. In fact, the fall in corn sales more than offset gains in the company's remaining four segments in the Seeds and Genomics and Agricultural Productivity Division. Results have been better when looking at the previous nine month period comparison, but corn sales are still down on lower volumes. Is competition catching up to the company's flagship segment? *Excludes Lawn and Garden segment. Source: SEC filings. New growth will come with new risks, however. On the third quarter conference call, management stated that currency conversions will result in a $0.15-$0.20 reduction in EPS in 2014. Growing the company's exposure to emerging markets will be great news in the long term by decreasing its dependence on farmers in the United States and Europe, but there will be some headwinds along the way. 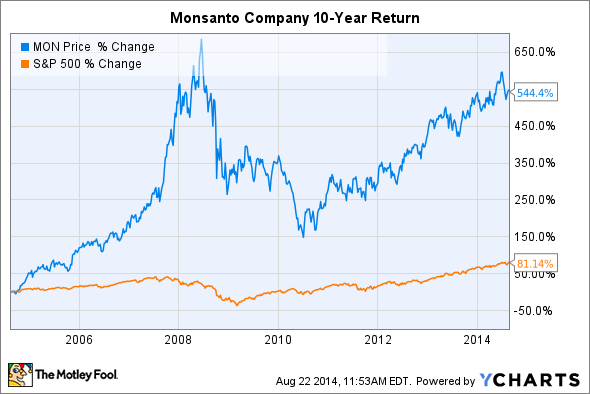 Overall there is a lot to like about the short- and long-term direction for Monsanto Company. Management has an eye on product development, organic growth, and strategic acquisitions. Of course, responsible investors will look at both the opportunities and risks facing their companies. Share buybacks that artificially increase EPS, falling corn seed and trait sales, and increased exposure to emerging markets with new risks could all cause Monsanto Company's stock to fall. At the very least, investors should be aware of the obstacles facing the company.